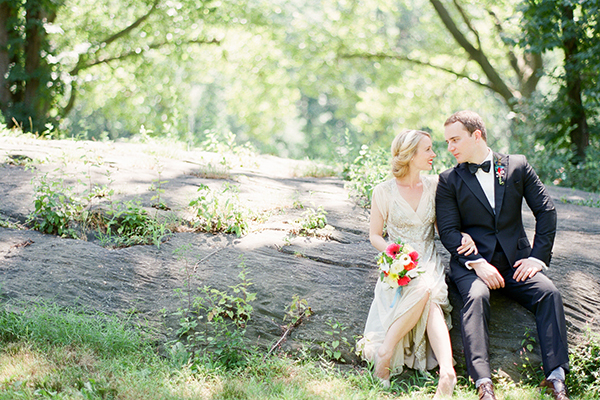 Jainé M. Kershner is a Fine Art Wedding Photographer specializing in Film Photography. She has a natural, romantic and timeless approach to weddings. In 2010, she founded Brklyn View Photography and has been featured in several wedding publications including Martha Stewart Weddings, Style Me Pretty, Brooklyn Bride, The Knot, Ruffled, WellWed, and Brides. Jainé photographed the modern wedding book “Weddings in Color” published by Chronicle in 2015. She lives with her husband and daughter in Brooklyn, NY. Visit her online at www.brklynview.com. Jainé has a unique ability to capture special moments and we knew that she would be the one to help us remember this important time in our lives. We were worried about being ourselves and acting natural in front of the camera, but she immediately put us at ease and made us feel comfortable. She has an amazing eye and directed our engagement session with ease, setting up beautiful shots and catching sweet unplanned moments along the way. Her use of light is truly amazing and added a uniquely romantic atmosphere to the shoot. We loved her work so much that we asked her to photograph my bridal shower too! We can’t thank Jainé enough for what she has done for us – we’re grateful to have such beautiful memories of our engagement! Jainé was a pleasure to have with us for our wedding. From initial meetings over the actual event to the final photo selection, she was easy and straightforward to work with. She managed to shoot some great pictures, while still leaving us plenty of room. She also was very accommodating, gracefully and without hesitation lettings us reschedule parts of our photo shoot due to bad weather. We definitely recommend her. Jainé is the kind of woman that you want by your side while planning the big day. She is calm, cool and funny. To top it all off, her photos captured every emotion that we felt as a couple both during our engagement session and wedding. Our love, passion and personalities can be seen in each shot, just as we hoped. Jainé captured our wedding day with perfect candid moments of our pure joy. Thank you for being an amazing friend and a truly talented photographer! jainé was a wonderful part of our city hall wedding. from her prompt response to my inquiry about three weeks before the wedding, to her thoughtfulness and open communication leading up to the day, to the very cold thursday in february of our wedding, to her follow up afterwards, we felt taken care of. jainé earned our trust immediately by demonstrating that not only does she know her craft and her business well but she’s also someone who truly cares about her clients. and the photos! they are beautiful and filled with light and love. we are so happy to have worked with jainé. I can’t say enough positive things about Jainé and BRKLYN View Photography! Both our engagement and wedding photos came out fantastic and from start to finish Jainé was a true pleasure to work. She was responsive and thoughtful throughout the process – even while we were planning our wedding from 3,000 miles away! And Jainé is truly a talented photographer. She captured beautiful, warm, candid moments, yet somehow managed to fade into the background during the day. Looking through our pictures truly allows us to relive the most wonderful day of our lives. Thank you Jainé! As a photographer myself, I am beyond uncomfortable when I am not behind the camera, and not to mention pretty particular when it comes to photos of myself. My fiancé and I did our engagement photos with Jainé in NY where we live since we are having a destination wedding next year, and we are beyond thrilled! She made us feel so comfortable and so at ease in front of the camera. She came to the session with ideas and poses to make us look incredible, feel and look natural, and we had such a blast! She already sent us a sneak peek of the session and everyone keeps calling me to tell me that we look amazing and like models in the photos. I can’t wait to use the images for the Save the Date and other wedding decor. I never thought I could feel so comfortable in front of the camera, and I didn’t think I would ever be so excited about photos of myself, but Jainé killed it! We are so happy, and anyone who hires Jainé would be so lucky to have her document such a special time in your life. She is a very talented lady! It was love at first sight when we initially saw Jaine’s portfolio, and we knew we wanted her to be the one to capture our big day. Turns out she was not only a master at her craft, but she was also such a sweetheart in person. From our engagement session to our wedding day, she instantly connected with us and made us feel so comfortable in front of the camera. And off camera, the lovely, thoughtful gifts she sent us every-so-often were little touches that surprised us and made our experience all the more enjoyable. The engagement and wedding photos turned out to be just the way we envisioned — stunning, sweet, whimsical, and documented those “perfect moments”. I can’t thank Jaine enough for her amazing work. She really poured her heart into each frame and it really shows in our albums. Jainé is absolutely wonderful to work with and a pleasure to be around. She took our engagement photos in New York City and made it such a relaxed experience. Scheduling was easy, turn-around time was fast, and everything was incredibly professional/top notch. We could not be happier with our photos and feel so lucky to have found our new friend Jainé. I absolutely adore Jainé! She was so friendly and efficient from the start, getting to know me and my husband, as well as all the little details. Despite the lengthy time gaps between the consultation, engagement session, and the wedding, she still managed to reach out to us periodically just to check in or send thoughtful gifts. Being an organized person myself, I never felt the need to remind her of anything. During the shoot and wedding, she made us feel at ease, allowing us to forget the camera and our surroundings. Not to mention her work is incredible, utilizing natural light and candid moments. I highly recommend her to anyone looking for a talented photographer with a genuine personality. Thank you Jainé! Jainé was an absolute joy to work with! She’s not only an exceptionally talented photographer with fabulously creative ideas, she’s also a well-organized and professional business owner. She kept in touch with us throughout the entire process: from our initial consultation through the designing of the wedding album – she even sent us thoughtful gifts throughout the year! We didn’t have any ideas on where to shoot our engagement session and Jainé had some amazing location suggestions around Brooklyn! Jainé has a way of putting people at ease, and the engagement shoot was so much fun! We were so happy with the pictures that we knew we would be in good hands on our wedding day. In fact, Jainé was so organized that we didn’t worry about a thing on our wedding day and she didn’t miss a shot! The wedding photos exceeded our already very high expectations! After we got engaged, our one and only “must-have” that we refused to settle on was an amazing photographer. We knew that after the vows had been exchanged and the last glass of champagne had been drunk, the photos are what would tell our beautiful elopement story to all our family and friends, both now and for generations to come. When we saw Jaine’s portfolio, we knew we had found our photographer soulmate…the one and only that would capture our most special day exactly as we remembered it. We couldn’t have been happier! We are so fortunate that Jaine was there with us on our special day. The process of finding the right wedding photographer was daunting but as soon as we met with Jaine we knew we found our match. Jaine was very helpful in explaining her style of photography and answered any questions we had. Hank and I were not into posed photos and we wanted to make sure she captured our real moments. Jaine suggested we have an engagement session (which we hadn’t planned on doing) to get comfortable in front of the camera and was she right! Our engagement session was great practice for the big day. We instantly felt at ease with Jaine and with her light direction, our engagement photos were fun, not forced. It definitely helped us feel comfortable and relaxed during our wedding photos! Jaine was in constant contact with us throughout the process and always sent emails just to check in and say hi. It was very comforting knowing that she was always there if we needed anything. Jaine has a true passion for photography and it shows in her amazing work. Thank you Jaine for capturing memories that will last a lifetime! We traveled to New York from Sydney to get married in a very intimate ceremony with only 11 guests. Photography was extra important as we wanted the moment captured in order to share it with our friends and family who weren’t going to be there. I contacted Jaine and she was always really prompt at getting back to me and answering all my questions. She was able to provide us with a smaller 4 hour package as our wedding was mid week and we didn’t need hours and hours of photography getting ready and covering the whole reception. She was super professional and gave us a questionnaire to fill out to ensure all our shots would be captured. On the day she had an assistant to help and was super professional, allowing us the time to celebrate after the ceremony but then guiding us to a beautiful spot in Central Park to have more formal photos taken, and then capturing some gorgeous images of my husband and I. At our reception venue in Brooklyn she captured our guests relaxing on the terrace enjoying champagne with the spectacular Manhattan skyline in the background, and she really understood how important it was for us to have iconic NY skylines captured in some shots given we are from Australia. Since we returned home Jaine has been in touch to keep us up to date on the progress of the gallery which she uploads to a site to make it super easy for us to select the images we would like to keep, and in fact has completed the gallery much faster than the initial time frame she gave us. She captured our day perfectly and we love the special moments she shot that are normally so hard to capture in a still image! My wife and I had such a positive experience working with Jaine! From Day 1, she was extremely organized and on top of everything. Originally we were not going to do an Engagement Session, but after talking to Jaine we decided to do one anyways, and we couldn’t be happier with that decision. It was a great opportunity to get to know Jaine (and have her get to know us) prior to the big day, and we ended up using those pictures for all sorts of things (shower invitations, rehearsal dinner invitations, etc.)! On the wedding day itself, Jaine’s professionalism and organization really helped everything go smoothly and efficiently. We had been having trouble finding a space around our Brooklyn venue to take our couples portraits that didn’t cost a fortune. Jaine took it upon herself to scout the area, and she found a pathway in a nearby park that was free, and ended up giving us our favorite pictures from the whole day! Overall, we had a great experience with Jaine, and more importantly we got a lot of gorgeous pictures that our friends, family, and a lot of Style Me Pretty commenters won’t stop raving about! Jainé is such a sweetheart and has everything (professionalism, passion, diligence, friendliness, and so on) you want from your wedding photographer. She shot our engagement and wedding photos, and working with her was the best decision we made throughout the whole wedding planning. We had a very tight and busy schedule (back to back engagement session and wedding) and Jainé was very helpful and flexible with scheduling. It was a very hot summer day in NYC when we shot the engagement photos. We all were sweating, but Jainé never lost smile on her face and helped us go through the process smoothly. Finally, we could’t be happier with our photographs. Jainé’s work is simply magnificent and faultless. We fall in love with our photos every time we look at them. We had such a great overall experience and would recommend her to anyone without any reservation. Jainé is an absolute dream to work with. From the second we spoke on the phone (we live in California but married in New York), we just clicked. She’s so easy to be around — one of those people who is constantly smiling and who in turn makes you feel more relaxed and comfortable — which was instrumental in us having a smooth and stress-free wedding day. She was always easy to reach with questions, which helped us feel confident even as we planned across the country. Jainé and her team were absolute professionals on the day, and the photos they took were absolutely amazing. She captured so many different aspects of our day with such beauty and grace, all without us really being aware that photos were even being taken. We are so in love with all our photos and can’t thank Jainé — or recommend her to others — enough!! Jaine made our wedding day. She was so wonderful and comfortable to work with, she put at us both at ease and capture not only the look of our wedding day perfectly, but the overall atmosphere and feeling as well. We have gotten so many compliments on our photos, and we will treasure them. Many people remarked that they couldn’t even tell there were two photographers there (she also had her assistant) which I think is one of the greatest things to say about a wedding photographer – someone who can capture all the intimate moments but doesn’t intrude on the night! I highly recommend her for both engagement photos and a wedding! Hope to use her again in the future for family photos! I feel so lucky that Jainé was our wedding photographer. Choosing the right photographer was really important to us. I came across Jainé’s work on wedding blogs. Her style struck me right away – the way she captured people, moments, light and space is beautiful and delightful. When we met Jainé in person, we clicked right away and knew she was the one for us! She was a joy to work with leading up to and on our wedding day. Jainé is professional, responsive, organized, passionate about her work, and most of all, so much fun to work with. I couldn’t be happier with our wedding photos and our experience with Jainé and her talented team. We were recommended to Jainé from a friend of a friend who was extremely happy with her as their wedding photographer. We looked at her portfolio online after getting the recommendation and were truly blown away. The natural light and life that she brings to photos were the best we had seen and as such were very interested. We reached out and had the pleasure of talking with her on the phone. As context, we had spoken with about 7 different photographers when we started planning the wedding as the photographer was the first vendor we tried to book. From the second we talked to Jainé on the phone she was just so easy to talk to and knowledgeable about the whole wedding planning process. Not only did she make us feel at ease but she offered us a list of recommended vendors which was extremely appreciated (many of whom we ended up using)! Jainé is extremely organized and as we were both focused on making the day perfect this was greatly appreciated. We went into our wedding day knowing that everything was going to be taken care of (especially since she crafted a detailed photography timeline of the whole day which involved 4 different venues). While we had met Jainé at our engagement photos she hadn’t yet met our families. Luckily we had the pleasure of having her come to our rehearsal dinner and as expected Jainé was great with everyone. She was friendly, professional, and just so easy to get along with. She was able to get to know everyone so it made getting photos at the wedding even more smooth. Her work speaks for itself but we can’t stress enough how amazing it was not to worry about anything photography related, arguably the most important part of your wedding since that is what you have to remember your special day by forever. We knew we would look at ease in every photo she captured because that’s exactly how she made us feel. We could not have picked a better photographer and are completely obsessed with all of our photos. We know that she will help us capture special moments throughout the rest of our lives as a married couple. We cannot recommend Brklyn View enough! They say people come into your life for a reason,” and that’s truly how we feel about Jaine! Finding a top notch photographer that reflected our “romantic yet whimsical” wedding vision was at the top of our to-do list and finding Jaine was a breath of fresh air. Following our first phone date, we were hooked. Booking Jaine was one of the easiest decisions we made and one we’ll always be thankful we did. Talent in New York is plentiful but Janie’s is something special. She is dedicated, detail orientated, organized, a team player, loyal, and her loving spirit is infectious. Jaine captured our engagement journey and our wedding day perfectly and we couldn’t be more pleased with the digital memories that followed. We recommend Jaine without any reservations! Jainé is an absolute gem and we cannot recommend her highly enough! She perfectly captured our special day, and we will cherish her photos forever. As soon as we met her, we knew she was “the one”. Her warm and friendly personality put us at ease immediately, so we knew we’d have no problem looking natural in our photos. Throughout the planning process, she was communicative and well organized. On our wedding day, she was efficient without ever making us feel rushed, and she was so discrete that we didn’t even realize she was there half of the time! She had such a calming effect on us, and for that we will always be grateful. Our photos turned out even better than we could have imagined. Jainé has such a keen eye for detail and her ability to work with natural light is incredible. We only hope that we’ll have the opportunity to work with her again someday! Thank you so much for capturing our day so beautifully! Looking through these pictures helps us relive that amazing day over and over. Jaine, I have been watching your work develop from the very start and I knew, even before I met my husband, that I would want you at my wedding one day! I was thrilled at the excitement you had when I told you my wedding would not be local and your complete willingness to travel, knowing you had just had your adorable Tilly! Your calmness during the day, during the sweltering heat and the adjustments we had to make because of it, helped keep me calm as well. Your organizational skills and attention to detail as a wedding photographer are exceptional, and for someone like me who felt I had to plan every detail myself, it was great to see that one of my vendors had actually done so much work for me before I had thought to! We have received so many complements on our wedding photos and we will cherish them forever! Jaine was the first and only photographer we spoke with for our wedding. After seeing Jaine’s work and meeting with her in person, it was love at first sight! Choosing all the other vendors for our special day was much more difficult in order to find the right fit for usI Deciding to go with Jaine was the easiest decision of the entire process and we booked her immediately after our first meeting. My husband hates taking photos and was nervous about our engagement session. Jaine and her team were so friendly and caring; she made the entire process so much fun walking around Brooklyn Heights where we first met. Even my husband admitted that he enjoyed the day and said it felt very natural! We were thrilled when we received our engagement shots and felt like Jaine really captured our love and the beauty of Brooklyn which is a special place for us as a couple. On our wedding day, the most special day of our lives, Jaine kept our large wedding party on schedule and was so enjoyable to be around with her calm demeanor and positive attitude. Jaine took such amazing photos of us and the Montauk Yacht Club where our ceremony and reception was held. I will cherish these pictures for the rest of my life. I can’t say enough wonderful things about Jaine and her photographic skills. Any bride and groom would be lucky to have Jaine as their wedding photographer; she is so talented and we feel like we’ve made a new friend! Booking Jainé as our photographer was the easiest and best decision we made! We were first drawn to her amazing pictures that we saw online. We loved how she was able to capture such special moments in a natural way. The lighting and softness of her pictures are beautiful! She is so talented and right away totally got what we were looking for. For our engagement photos she made us feel so comfortable and helped us pick out the best spots. She really helped us plan out our wedding day timeline. She was able to grab the attention of our bridal party and give guidance to the larger group. Our wedding photos perfectly captured the vibe of the entire day and night and we continue to get compliments on them! She is so detail oriented, professional, and able to execute on your dream wedding photos!